It has become a rite of summer for the Vanguard Cadets Drum and Bugle Corps of Santa Clara. If it’s June, it must be time to pack up the brass instruments and the colorful flags and the gear and head for sunny Denair. Any why not? The formula keeps working. In 2017, the Bay Area group captured Drum Corps International Open Class Championship for the fifth time (and third since they’ve been training in the valley heat). In the mind of Steve Barnhill, the corps’ longtime director, there is no reason to mess with success. Indeed. Temperatures in the low to mid-90s are expected to greet Barnhill’s 150-member corps and their 30 adult coaches and chaperones when they arrive early Thursday evening. Last year, Vanguard endured a heat wave, with daily highs well above 100 degrees. This is the ninth year in a row that the Santa Clara contingent has kicked off its competition season in Denair. Essentially, the week in the valley is the equivalent of spring training in baseball or summer camp in football. Though they’ve been practicing at their headquarters, this is where serious details are perfected. Denair opens up its middle school campus for the week. The cadets – ages 14 to 21 – sleep in the Coyote Center while the adults use air mattresses and sleeping bags in various classrooms. Meals are prepared in the high school cafeteria. Days are spent in small groups refining techniques, practicing music and perfecting the choreography. Practice starts at 8:30 a.m. and doesn’t finish until after dark. There is no TV and limited time for social media. For those not familiar with competition drum and bugle corps, there’s one thing to know – it’s loud. Vanguard features 72 horns in its brass section (trumpets, mellophones, trombones and tubas) and 37 percussionists playing snares, quads, xylophones and marimbas. When they start making music, the notes can be heard a mile away. There also are another 37 teens in the color guard waving flags, twirling rifles and dancingas well as four drum majors. About half the corps is back from last year, when Vanguard won its fifth national title since 2000. 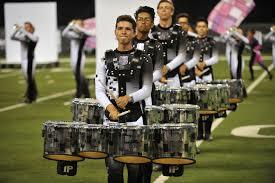 In the word of drum and bugle corps, Vanguard is something of a dynasty. As always, on the final night in Denair (June 21), there is a dress rehearsal of this year’s performance – entitled “Off the Wall” – at Jack Lytton Stadium. It’s free starting at 8 p.m. for anyone who’s curious about what all the noise is about. After that, Vanguard takes off from competitions in Clovis, Sacramento, Southern California, Bakersfield and Pleasant Hill. They all lead up to the national championships the week of Aug. 6 in Indianapolis. Posted in News and tagged drum and bugle corps, Santa Clara Vanguard.